Starring Lola Kirke, Zoë Kravitz, Greta Lee, Michelle Forbes, Nelson Franklin, Reeve Carney, Jessica Parker Kennedy, James Ransone, Ricki Lake, and John Cho. Films set in LA tend to be about Hollywood, actors, showbiz, etc. 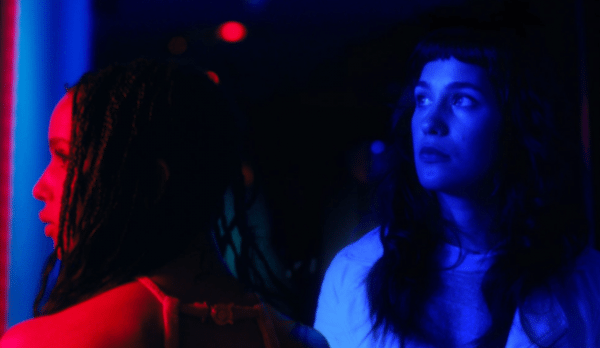 Aaron Katz’s slow-burn mystery Gemini is no exception, however, whilst it is set in the city of the rich and famous, it portrays a completely different side of the industry to one we commonly see on-screen, as seen through the eyes of young Ohio-born PA Jill (Lola Kirke). Jill is the assistant to Heather (Zoe Kravitz), a big-name actress hounded by paps and fans alike, who maintains a friendship as well as a professional relationship with her PA. After a violent incident at Heather’s house which the police suspect Jill is guilty of, Jill must evade a very determined detective (John Cho) and prove herself innocent whilst figuring out who the real perpetrator is. Gemini is the fifth feature directed by Katz, and the third of his which incorporates elements of the mystery genre. The first third of the film follows the relationship between Jill and Heather and their involvement in each others’ lives, the next hour following Jill through the city of angels as she searches to find the person responsible for the incident at Heather’s and clear her name from the top of the police’s list of suspects. Kirke brings a genuine humanity to her character – something that can’t often be said about the lead in a Hollywood-set film – allowing the viewer to easily connect and sympathise with her. Kravitz’s Heather might not be quite as likable, but she’s still very real and feels much more like an actual person than a movie star. Similarly, the city of LA itself – a character here as much as Jill and Heather – doesn’t feel glamorous and glitzy, as Katz strays away from showing too much of the movie business to focus on the areas most Hollywood-set films don’t bother going to – the suburbs, Koreatown (possibly last seen on-screen three years ago as Mark Wahlberg ran through the streets to M83’s Outro in The Gambler), etc. It feels very refreshing to see different sides of such a well-trodden city portrayed on-screen, especially for the majority of a film’s running time. Katz portrays these spaces well, giving the viewer a real feel of them as actual places rather than just locations on-screen. The mystery at the centre of Gemini is certainly an intriguing one – to say any more would be to divulge spoilers, but the big reveal is not easily guessed. The ending, though, is perhaps the film’s weakest point. It’s not so much underwhelming as it is not particularly powerful – the final reveal feels somewhat smaller, less impactful, than it perhaps could’ve, but nevertheless leaves the viewer with something to think about, and as I mentioned, can’t be seen coming. For the most part, the film is really well-paced – in fact I thought it felt shorter than its 93 minutes, more like 70. Katz is a director very interested in genre, and with Gemini manages to make an engaging, character-led, old-school mystery with elements of a thriller and a female buddy comedy, all working well together. It’s the kind of film we don’t see very often, but I would certainly welcome more of.